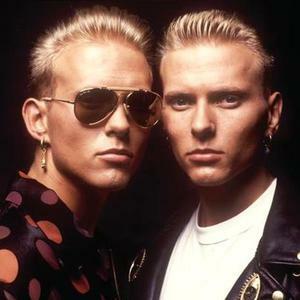 Bros were an English boy band active in the late 1980s and early 1990s, consisting of the twin brothers Matt Goss and Luke Goss along with Craig Logan. They were managed by former Pet Shop Boys manager Tom Watkins, who it was rumoured was actually one of the main songwriters, working under the name "The Brothers" with other songwriters to give the impression that the Goss brothers were the actual writers of the early hits. Their first single, I Owe You Nothing, was released in 1987 on CBS. The second, When Will I Be Famous reached number two in the United Kingdom. Their first album, Push, was released in 1988. The group achieved a total of 11 top 40 singles and three Top 40 albums in the United Kingdom, making them one of the biggest acts in British music between 1988 and 1993. They reached number one when "I Owe You Nothing" was re-issued in 1988. Consequently, they also sparked a fashion craze of attaching Grolsch bottle tops to their shoes. Logan left the band in 1989, and the Goss brothers continued touring. A second album, The Time was released in 1989 followed by Changing Faces in 1991 before the band imploded in 1992, amid contractual and money issues. Matt Goss started his solo career in 1995 and has enjoyed more top 40 success, especially after being one of the chefs on Gordon Ramsay's Hells Kitchen (ITV). Luke Goss appeared in west end musicals throughout the 1990s and has also appeared in several movies since 2000, including Blade II, a 2004 TV version of Frankenstein as the creature, and he co-starred alongside Samuel L. Jackson and Eugene Levy in The Man. He also recorded several singles himself, including "Sweeter Than The Midnight Rain" with his 'Band Of Thieves', and was briefly signed to One Little Indian records. Craig Logan managed P!nk and in 2006 was put in charge of Sony BMG's RCA Records label group.